A few weeks ago, I attended a civic club meeting where we talked about minimum lot size restrictions. Many of my neighbors were concerned about townhouse developments in the neighborhood, and the City of Houston Planning Department was on hand to teach us how to apply for minimum lot size protection. Minimum lot size restrictions are one of the few ways that Houstonians can prevent real estate developers from tearing down an old home, subdividing the lot, and building taller, denser housing in place. For a lot of neighborhoods, this kind of dense development — specifically townhomes where single family homes used to stand — is not a welcome addition to the housing stock. It can put a strain on neighborhood infrastructure and lead to higher property taxes for the surrounding area. This mural by Ack! 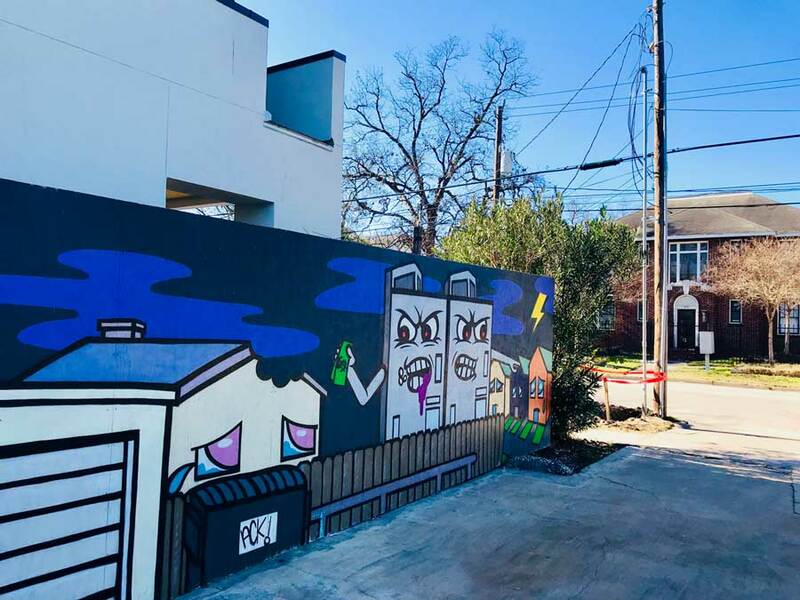 shows gentrification concerns in midtown Houston. Establishing a minimum lot size means that no one can subdivide their lot smaller than the agreed-upon minimum. In other words, it prevents the development of townhomes where single family homes used to stand. 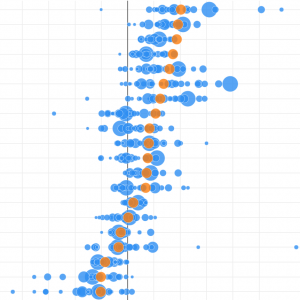 Instead, it should encourage development that more closely matches the existing housing stock. First, contact the City of Houston Planning Department for guidance. They will manage most of the process for you. You need to get signatures from 10% of the property owners in your area (for an area application) or five signatures of owners on your block/block face (for a block application). There will be multiple notices to your neighbors, and if you’re filing an area application, there will be a community meeting and a public hearing. There will be a protest period. Ultimately, you’ll need at least 51% (for block protection) or 55% (for area protection) of the property owners in the zone to approve. Once you obtain a minimum lot size restriction, it stays in effect for 40 years. Since you need the signatures of property owners, I built these maps to help people know where the homeowners in their neighborhood live. 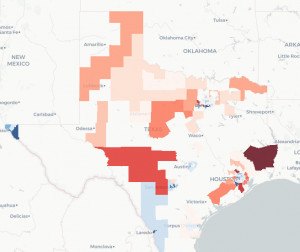 Harris County Appraisal District (HCAD) provides a lot of data about property owners. If you own and live in a property, you qualify for a Residential Homestead exemption on your property taxes. Most people take this exemption because it provides a 20% discount on property taxes. So it’s a great proxy to know whether the owner lives at the property. If you’re gathering signatures for a minimum lot size petition, this will help you know which doorbells to ring. For the maps below, I used HCAD data to outline all parcels in red, filled in the lots with a homestead exemption in green, and overlaid minimum lot size restrictions from the City of Houston Planning Department in purple. Not every lot in a designated zone needs to meet the minimum requirements. 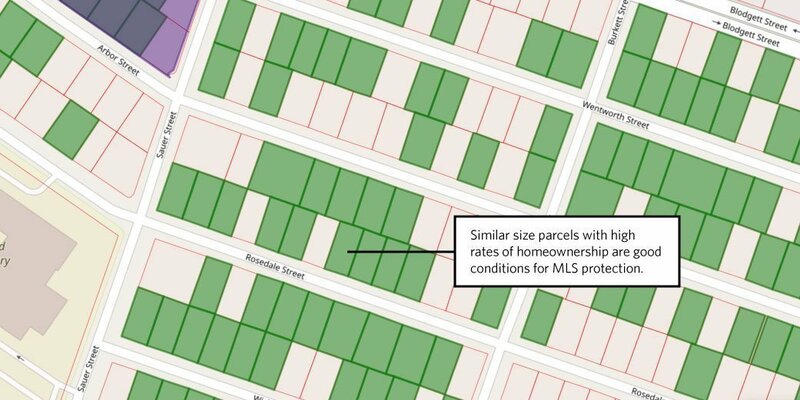 Using these maps, you can quickly spot odd sized parcels to determine if your target area meets the 70% threshold. Some neighborhoods are easier to analyze than others. 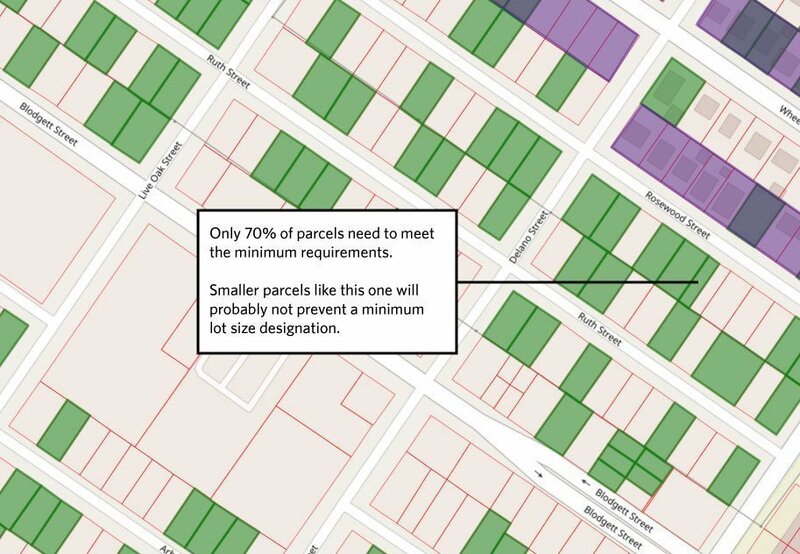 Similar size parcels with high rates of homeownership are good conditions for minimum lot size protection. I wanted to look at Riverside Terrace and the Greater Third Ward because they are gentrifying areas where minimum lot size restrictions could change the type of real estate development that happens in the future. The lots in Riverside Terrace are somewhat uniform, and many blocks already have minimum lot size restrictions. A lot of the unprotected blocks feature high rates of homeownership and standard lot sizes, so they are good candidates for protection. The lots in the Third Ward are much trickier. There are a couple of conditions that leave the Third Ward vulnerable: a lack of owner-occupied housing density, short blocks with irregular lot sizes, and small pockets of redevelopment already underway. Last year, Houston’s mayor Sylvester Turner launched the Complete Communities initiative. The goal of this program is to prioritize improvements to Houston’s most vulnerable neighborhoods and residents. You can learn more about Complete Communities here. As we field requests for other neighborhoods, I’ll add them to the list here. Don’t forget to contact the Planning Department as you start to think about minimum lot sizes in your neighborhood.